Estrogen is the female reproductive hormone and it plays a major role in a woman's fertility, specifically during pregnancy. Significant amount of estradiol (i, e; a form of estrogen) has the human corpus luteum, playing a large role in conceiving. Decreased levels of estrogen affect women's bodies during pregnancy, resulting in hot flashes and night sweats. 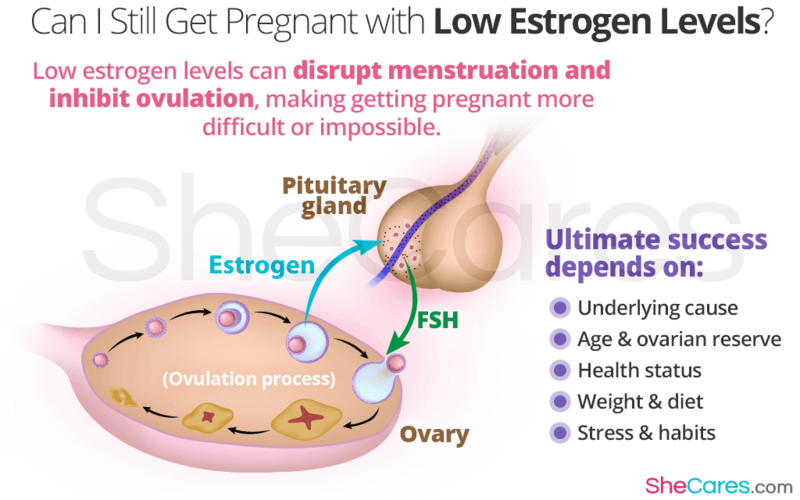 Low levels of estrogen can cause more than just annoying symptoms, but the imbalance also has an impact on the menstrual cycle, affecting the lining of the uterus, resulting in no ovulation. If ovulation is not occurring in a woman's body because of low estrogen levels, there are two possible causes for this problem. Gland problems or the ovaries are incapable of releasing eggs. If you over exercise, are underweight, or are suffering from an eating disorder, you may be adversely affecting the pituitary gland, so that it cannot send proper signals to the ovary. Women who are suffering from gland problems, have decreased estrogen levels and their bodies do not release an egg, causing no ovulation. And without ovulation there is no chance for an egg to be fertilized and a woman cannot get pregnant. If a woman has low estrogen levels, the next step would be to test the blood level of the follicle stimulating hormone (FSH); a hormone produced by the pituitary gland that tells the ovary to make estrogen hormones. When ovaries can't release eggs, the pituitary gland sends out more FSH in an attempt to get the ovary to respond. For women who have high FSH levels, it's a sign that the pituitary gland is trying to stimulate the ovary, but is not having any success. Ovulation, or the releasing of eggs goes hand in hand with hormone production. So, if eggs are not present, means that estrogen are not being produced. Although this may seem very discouraging if you are trying to get pregnant, but it is still possible to conceive. However, it can make becoming pregnant much more difficult. You should talk to your doctor about your fertility problems and low estrogen levels if you are trying to get pregnant before taking any hormonal supplement. If you want to learn more, click on the following link about estrogen and how to manage it.